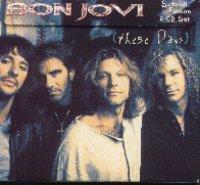 Commercially this didn't become one of Bon Jovi's biggest albums, but to me it is one of their best to date. They display a completely different side of their innovation and creativity as musicians. I remember going to the local record-store the day this album came out and I bought it straight away. My first reaction when I listened to it was how different the sound was from earlier albums like "Keep The Faith" and "New Jersey". Now, over five years later since it came out I have really seen and come to love this album in it's own true essence. Lyrically this is their best job ever. It tells a lot of different stories about love, faith and just the hard things you may face in life as you go along. How things can change in a day, or just in the blink of an eye. I love all of the songs on this album and each and every one of them have their own amazing story to tell, and I could give you my opinion on each and every one of them. But I won't.. Cause then this review would just be way too long! The first single of this album was the progressive love ballad "This Ain't A Love Song" and it really tells a heartbreaking sad story. A relationship between to people so much in love only to after some time seeing it all end and fade away. Everyone who's ever gone through tough heartaches can relate to this song, I for one can..
"These Days". Wow, what a masterpiece! The lyrics tells different stories about how people just want change in their life in some way. They just don't want to experience the same things over and over again, and you really feel how some feelings can drive one to do the most wonderful, or destructive things for that matter. I can't call this one a love song nor a rock song for that matter, but it's just something in between that. It just touches several different parts of me and it makes me feel good about myself..
"Thank you Bon Jovi, thank you for making such a wonderful album. It really makes me appreciate the privilege I have to love someone, and be loved just as much in return. Thank you....."
Album Notes: Bon Jovi: Jon Bon Jovi (vocals, percussion, harmonica); Richie Sambora (acoustic & electric guitars, electric sitar, background vocals); David Bryan (keyboards, background vocals); Tico Torres (drums, percussion). Additional personnel: Suzie Katayama (accordion); Jerry Vivino (tenor saxophone); Ed Manion (baritone saxophone); Mark Pender (trumpet); Richie LaBamba (trombone); Jerry Cohen (keyboards); Robbie Buchanan (keyboards, programming); Hugh McDonald, Randy Jackson (bass); Tommy Funderburk, Rory Dodd (background vocals). US version is missing "All I Want Is Everything" and "Bitter Wine" released as a Mega Edition in Europe and Japan with bonus CD. Released back in those Days. 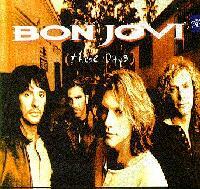 A review by Jaclyn 'BonJoviFanForever' S.
This album really gets u thinking! Before you write it off, LISTEN TO IT MORE THAN ONCE...IT IS AMAZING! These Days is definently one of the Best! The absolute WORST BJ Album Ever! Am I The Only One Who Gets This Album Deeply?? My feelings about "These Days"